I was curious to how hard it is to replace the head gaskets in this motor. Is there anything in specific I need to watch out for? Or replace? Besides the gaskets themselves I will be installing new head bolts. How much of a beotch is it to get this done? im new here but definitely not new to my ‘92 4x4, 5 speed manual. I’ve had her for 20 years. After 238K miles she blew a head gasket. She’s creating rain clouds out the tail pipe. LOL. Not that bad at all. 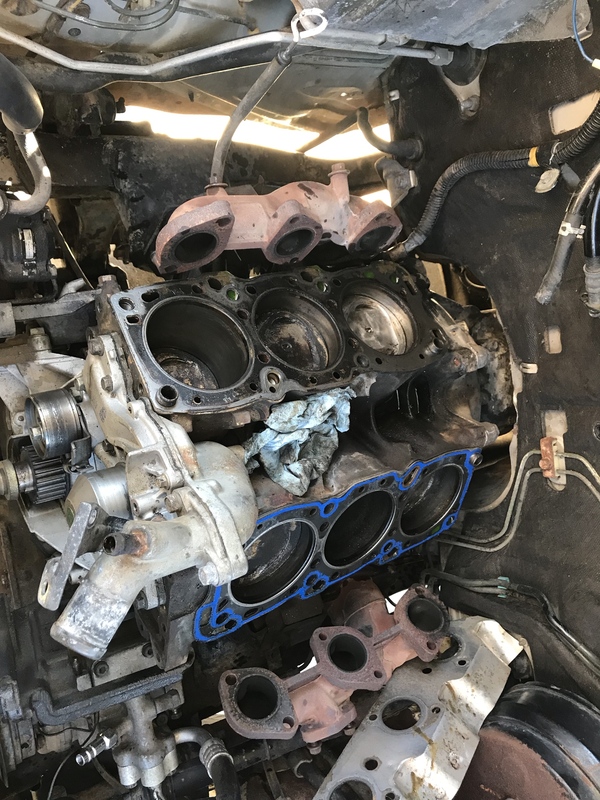 Ive done two engines in the last year (one for my Montero and one for my dads Ram 50) Get a new timing belt kit and water pump while you are at it. Use Gates or OEM (they are the same). I've also used Felpro steel head gaskets as they are the best IMO. I swear i found the head-gaskets for like $9 each on amazon. Look under Fel-Pro 9112 PT and see if they still have the deal going. You have to pull the intake and most of the front off the engine as well as the exhaust manifolds. It should look something like this when you get her open. Once you have it apart, clean it up, so you can see where you were blowing fluid. The cylinder that looks the cleanest is your best bet. Look closely at the oil and coolant passageways on the blocks deck. 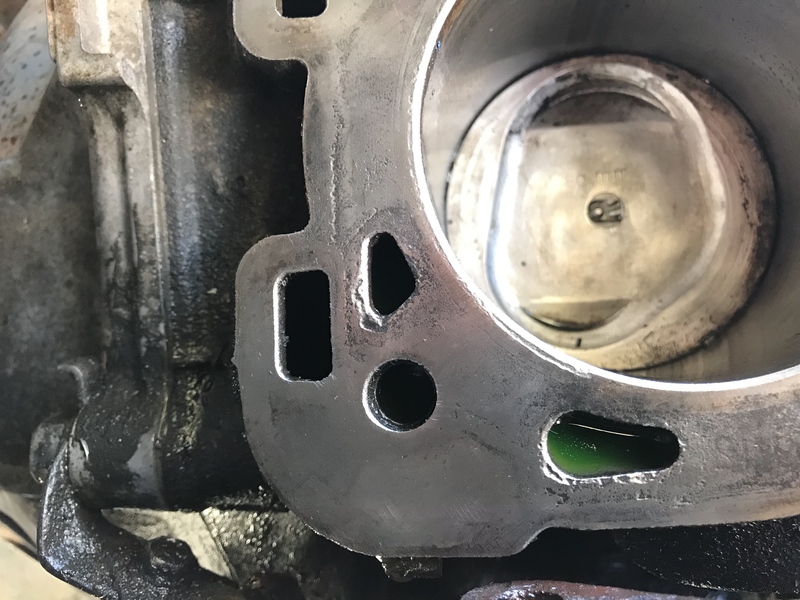 Any slight oxidation or pitting is a tale tale sign of where either your gasket, or your block allowed seepage. In my case the very center of the screen is where mine failed. I could have pulled the whole motor and sent it in to be decked, but thats a lot of work I really didnt need. I spent several hours sanding the deck surface with a straight edge and med/fine grit sandpaper. Then took some compressed air and blew out all my sand in the cylinders and put it all back. Both engines run great to this day. Or just drop a 3.8L MIVEC in. 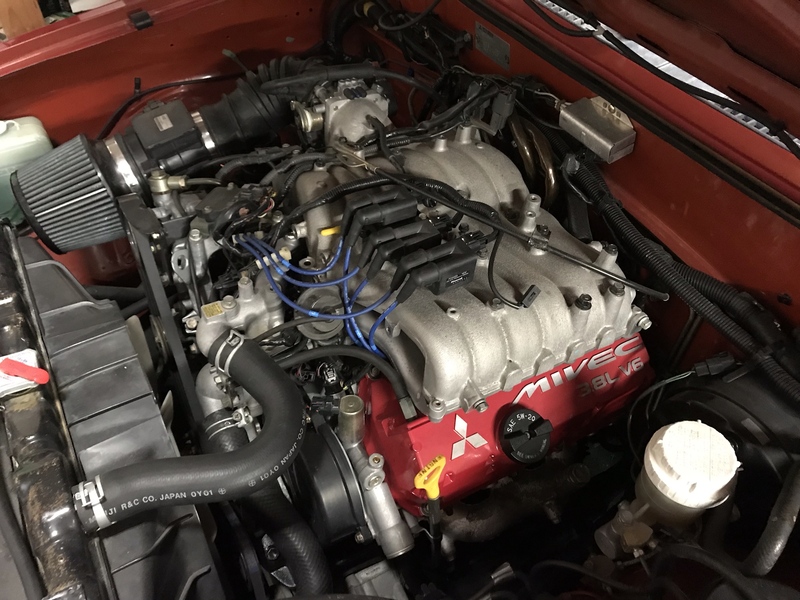 How do you make the pictures so big?, and what kind of radiator cap is that? I upload my pictures to Imgur so they come out better quality and are super easy to link. Rad cap i found in the junk yard. I dont have it in front of me but I like that it has the red lever to release pressure without getting myself burnt by coolant. Really haven't had a need to use it though.